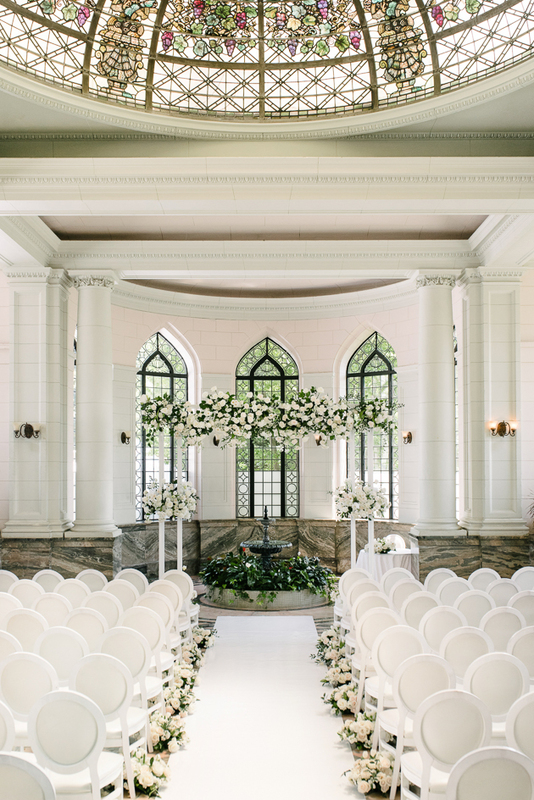 Fall In Love With This Modern Chateau Le Parc WeddingFeatured in Wedluxe, this wedding is dripping with details! What can I say about Michelle and Mark? For starters, these two lovebirds are some of the sweetest people I’ve had the pleasure of meeting. Absolute jet setters, these two love to travel and are total culture junkies. Let’s not forget their impressive resumes: Mark is a professional hockey player in Europe and Michelle is a woman of many talents. 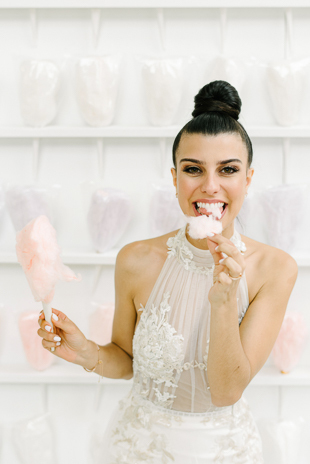 Well versed in the wedding industry, Michelle is the owner of Sincerely Yours Events and the face behind Fancy Puffs – a specialty cotton candy company created for events and weddings. 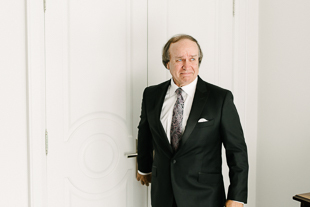 When Michelle asked Mango to photograph her Chateau Le Parc wedding, I was both honoured and so excited. 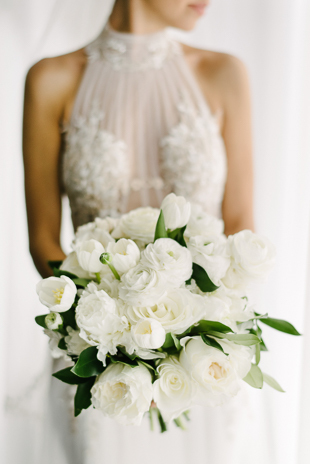 Michelle enlisted other A-list wedding experts – Rachel Clingen Floral & Events and RDT Events and Beauty – to help her vision come to life. 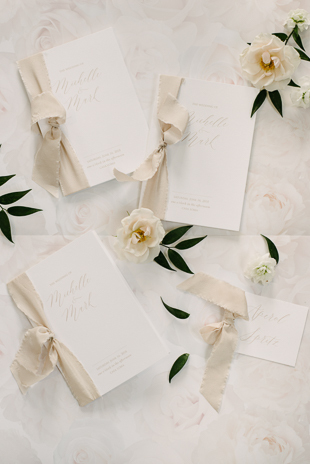 I couldn’t wait to see what this event-planner extraordinaire had in store for her very own wedding! I knew if Michelle was involved it was going to be modern, elegant – and of course, “fancy”. 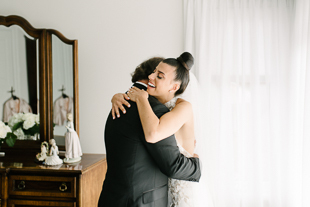 The wedding day itself started out oh-so-sentimentally: Michelle got ready in her childhood home, soft light filtered into the bedroom, and I thought – is this for real? 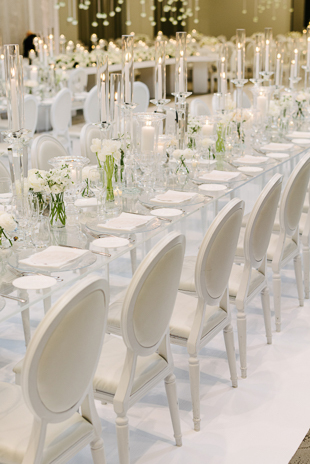 Michelle’s vision was an all-white wedding of modern and clean design, with a feel of elegance and sophistication. The scene in the bedroom could not have been more perfect, as I played around with the sheer draping to capitalizing on the gorg light filling the room. 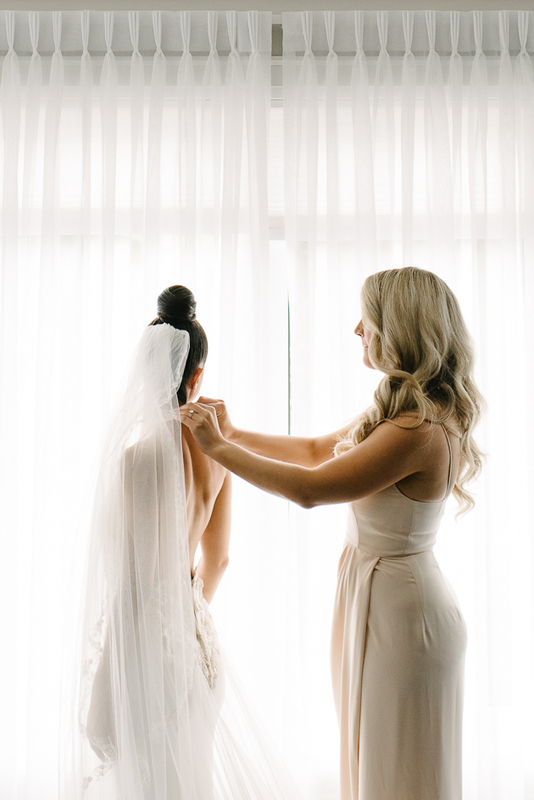 Placing Michelle in front of the window allowed me to stay true to Michelle’s all-white wedding day palette and create bridal portraits that are soft and delicate yet still clean and modern. 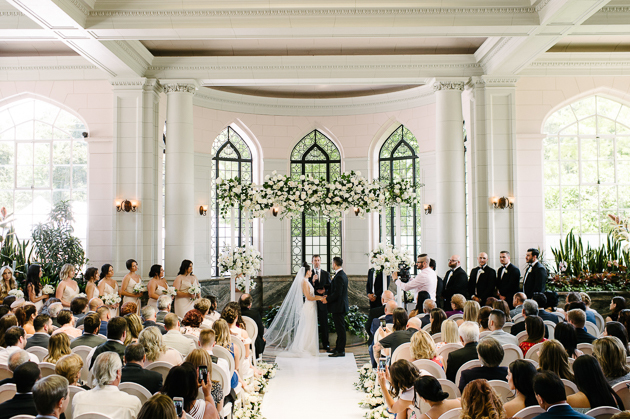 The ceremony took place in the conservatory of Casa Loma. Wow, was it ever special! 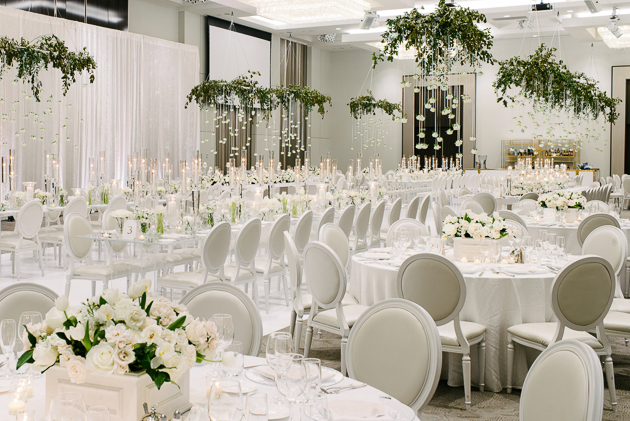 An altar of white florals and greenery made a statement at the front of room. The whole design was so beautiful and fit the space perfectly. I couldn’t wait to photograph an emotional Mark as he first laid eyes on his wife-to-be. 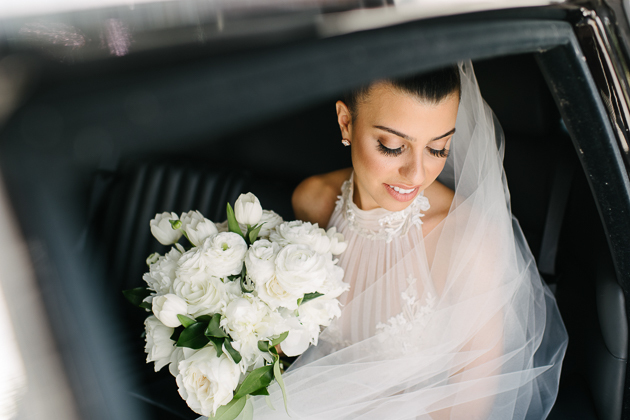 As Michelle floated down the aisle I – and every other guest there – captured her beaming at her groom. 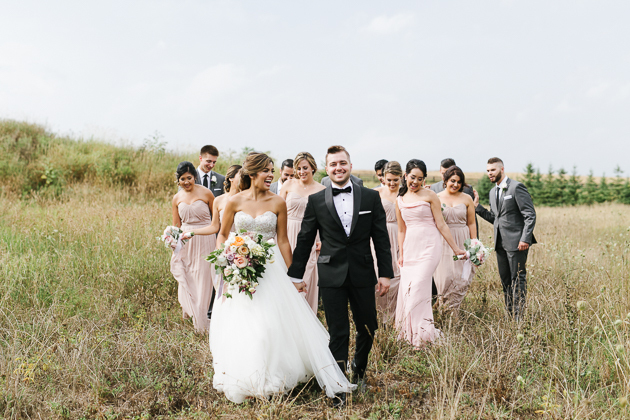 Though the wedding was technically in spring, it was during a particularly hot spell of weather. You know the ones I’m talking about: 30 degrees and lots of humidity. The bride and groom were absolute champs! 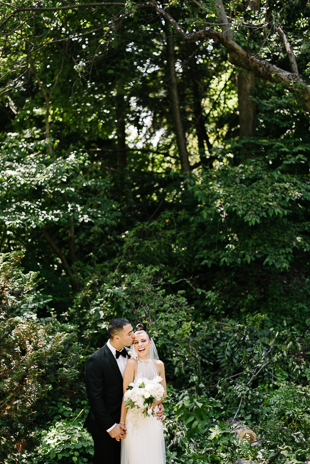 We explored the gardens at Casa Loma, and among the gorgeous foliage we found some really beautiful shady spots that photographed beautifully. 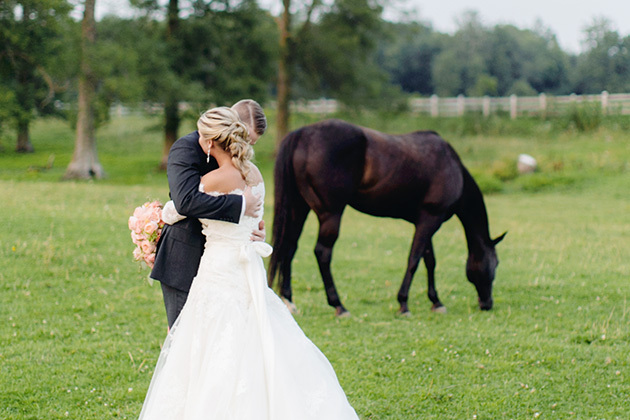 It’s such a dream when my bride and groom are just as excited as I am to create stunning photos. It often feels like we’re all on this exciting adventure together, all in the name of capturing unforgettable photos of this monumental day. 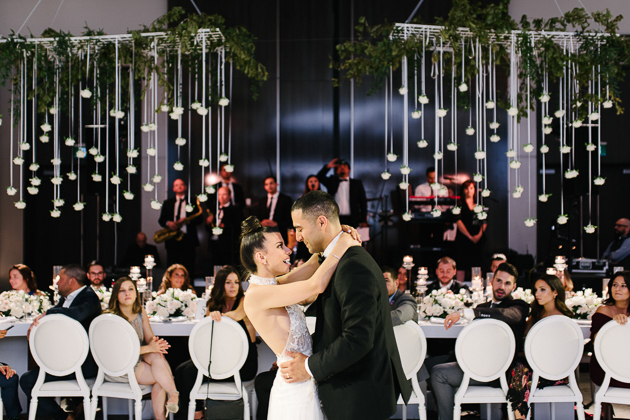 Michelle and Mark chose a Chateau le Parc wedding for many reasons: the space is contemporary, but has so much grandeur that it’s an obvious choice for a sophisticated yet current wedding. It also seemed like the perfect location for her incredible vision to come to life. As I entered the room I was awe-stricken by the sheer creativity of the decor Michelle and her wedding dream team designed. 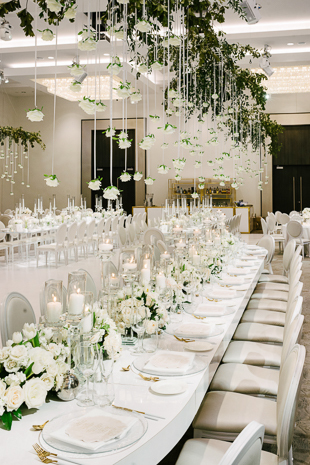 Picture this: suspended from the ceiling were countless large bundles of greenery with dozens of roses delicately cascading down. 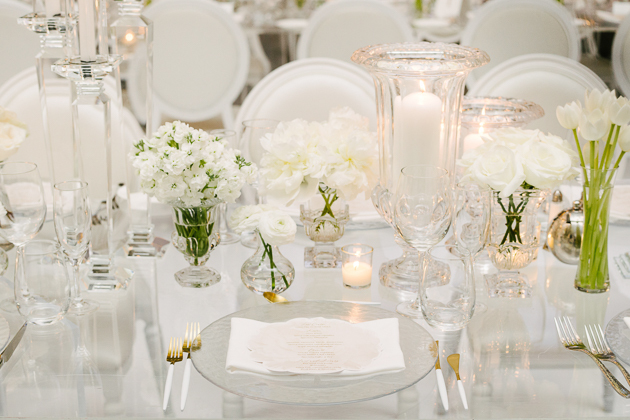 More white florals lined the tables with plenty of crystal accents sparkling bright. 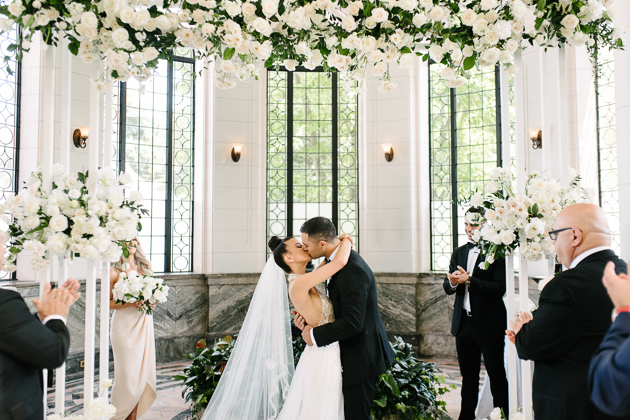 As a wedding photographer, I LOVE when a reception is utterly unique and a total reflection of the couple’s personal style. 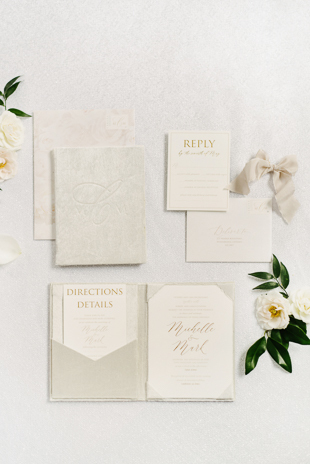 I also love it when I have the opportunity to get super-creative with my photography – with Michelle and Mark’s reception decor, I was able to experiment with interesting angles and compositions that really captured the dynamic space. 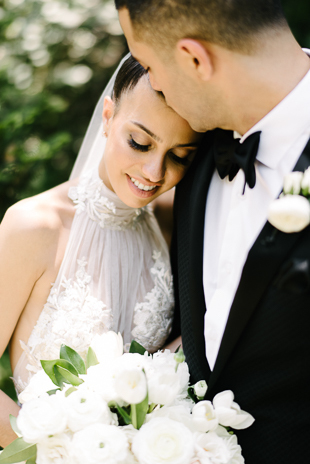 I knew I would have some fun capturing the ultra-fab details but honestly, every expectation was exceeded. Okay, let’s not forget that cotton candy wall. Don’t you just want to take a bite out of those fluffy puffs?! 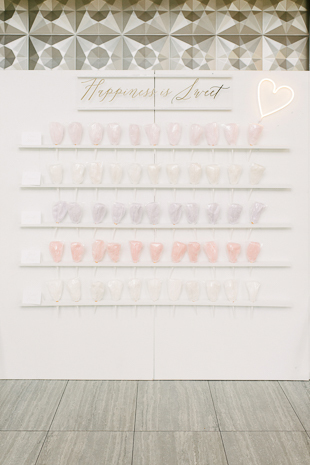 Positioned in front of Chateau le Parc’s cool, geometric wall, the soft colour palette created such a beautiful fixture to photograph the bride in front of. We had SO much fun playing around and snapping photos, and Michelle couldn’t resist snacking just a little bit. It was an absolute honour to be part of Michelle and Mark’s wedding. I can’t wait to see what these two have in store next. Whatever it is, it will certainly be legendary – and Mango will be there to capture it! 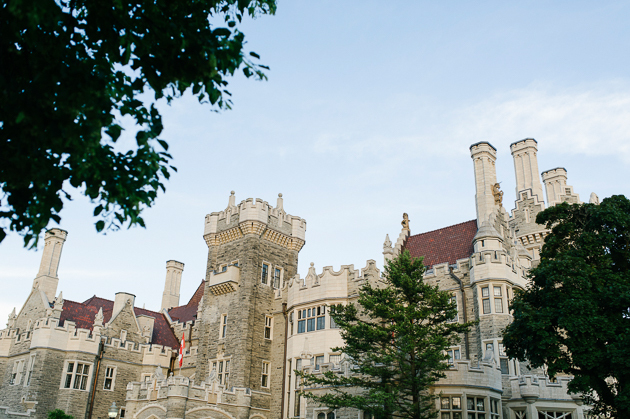 Chateau Le Park and Casa Loma pair so well together. Great job to whoever shot and edited this because the colours are out of this world!